I dropped this question on Twitter two or three months ago, but as my count of real followers is in the dozens (if that), I got no response, but I'm still curious: How many silent movies do folks in other cities get to see on the big screen in a month? This particular week was anomalous, with at least five on tap (these two and three of "The Hitchcock Nine"), but there's generally one or two in a given month. I suspect the units would be inverted in many other cities - how many months between silents - which means I'm very lucky as a Person Who Likes Silent Movies. It's a coincidence in this case, as three separate series converged: The Stomp Boston! giant monster movies at the Brattle, the Somerville's monthly visits from Jeff Rapsis, and the HFA's "Complete Alfred Hitchcock" summer. I'll get to the Hitchcock stuff later in the week (maybe even tomorrow, depending on how much time I have for writing on the bus), but the other two were both entertaining shows in their own way. 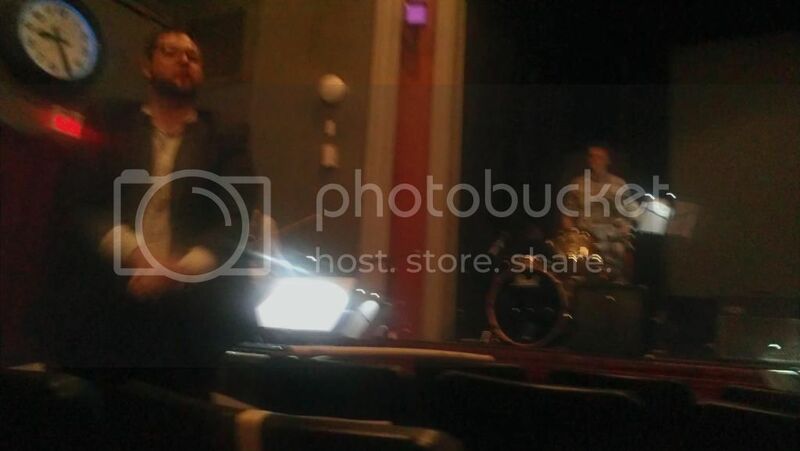 I saw the Alan Alden Ensemble last fall, when the Brattle had them accompany Nosferatu, and I have to admit - they're not exactly my favorites for performing along with a silent movie. Especially early on, it seemed like they were deliberately trying to subvert silent-film music tropes, playing something a little more aggressive than usual while the movie was still doing set-up. It rubbed me the wrong way at first, although I either got used to it or the initially jarring stuff paid off later, as I certainly wasn't noticing how the music wasn't quite right by the finale. The movie itself seemed to be one of the shorter cuts, as I think we were out of the theater by within an hour and a half even with delays and introductions. Maybe that's why some of the love-triangle-related stuff seems relatively abrupt - I can certainly see the mushy stuff getting cut over the years even while the action stayed in. 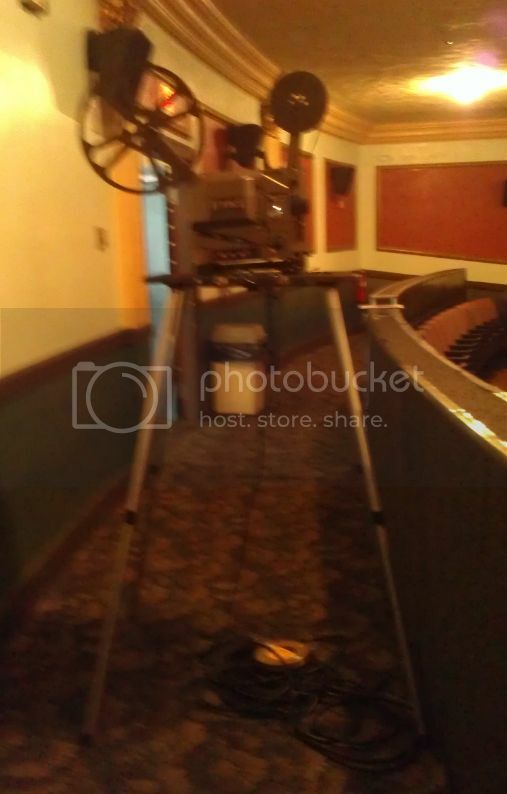 For some reason, I'd always assumed that the Somerville Theatre's booth was set up for 16mm, but projectionist David Kornfeld and company set this up behind the main auditorium to screen the 1907 version of "Ben Hur". According to Dave's humorous introduction, there are pretty much no 35mm prints left of anything produced by Kalem Company, which produced this version of the story to great enough success that the novel's copyright holders came after them, hitting them with a lawsuit that eventually made it to the Supreme Court and ended with Kalem having to pay $25,000 - which, a hundred years ago, was a tremendous amount of money. He then proceeded to spend some time reminding us how D.W Griffith established a lot of modern cinematic grammar after this movie was made, assuring us that laughing at the primitive nature of what we were about to see was A-OK.
And, yeah, we laughed - although I think most of us held out until the chariot race, as the thing was mostly just perplexing up to that point, when even us computer science majors could see that this was not an effective way to make a movie. Sir Arthur Conan Doyle's second-most famous creation turned a hundred last year without a whole lot of fanfare; Professor George Challenger didn't have the sheer number of great (or even good) stories that Sherlock Holmes did. That first one, though, is a classic adventure story, and the silent 1925 adaptation brings the fun to the screen so well that it has remained the definitive version ever since. Heck, it would arguably be almost seventy years until the next great dinosaur movie. Not that any reasonable person in London believes Challenger's stories about dinosaurs on a plateau in South America. But Challenger (Wallace Beery) can work people up, and soon has a party put together for a rescue mission: Famed sportsman Sir John Roxton (Lewis Stone), reporter Ed Malone (Lloyd Hughes), skeptical scientist Professor Summerlee (Arthur Hoyt), and Paula White (Bessie Love), the daughter of the missing explorer whose diary is leading them to the so-called Lost World. In some ways, the big effects-driven action/adventure movie hasn't really changed all that much in the past century - screenwriter Marion Fairfax and "dramatic director" Harry O. Hoyt save the expensive stuff that sold tickets for the second half of the movie while spending the first half getting everyone to the scene, filling time with humor that involves a trained monkey while building a love triangle between Roxton, Paula, and Ed. It's pleasant enough, and actually does pay off during the climax, although in the shorter cuts of the movie, things do seem to jump around a bit (like far too many silents, The Lost World was frequently cut and had prints destroyed, and we're fortunate that it's been reconstructed as much as it has). Ed seems to forget his fiancee (Alma Bennett) fairly quickly, for instance. This 15-minute silent version really should not be one's first encounter with Ben-Hur. That's not so much because it's from the very first years of the twentieth century, when filmmakers hadn't really figured out how to make a movie beyond "point the camera and capture what happens", or because it's not exactly great execution by those standards. No, the simple fact is that it was made in 1907, when its entire audience could be assumed to have either read Lew Wallace's novel or seen an adaptation performed on stage, and this short doesn't seek to tell the story so much as illustrate it. The intertitles don't present dialogue or impart information so much as announce which thing that a moviegoer might have been eager to see realized comes next. So, if you're like me and don't know the story already, the thing is kind of incomprehensible, at least until after seeing one of the later iterations. It's still kind of amusing from the "look at how they used to do this!" perspective, and in a way rather educational: The "injury of the Roman official" scene is an object lesson in how close-ups and cutting can be more effective than a wide shot at times (I didn't know where to look until after things had already happened), while the chariot race demonstrates the importance of following action rather than letting it pass. It's rough to watch, but for an audience that loved the source material, it was exciting - and as someone who has come out of superhero movies like "yes! that's what I've wanted to see for twenty years! ", I can't fault them for that - which made it successful enough at the box office to get the copyright owners' lawyers involved. Today it's mostly interesting for its place in history and as an example of early cinema, but that's at least worth something. Though the later version starring Charlton Heston is the most well-known adaptation of Lew Wallace's hugely popular nineteenth-century novel Ben-Hur, the ones that came before it were big deals as well: A 1907 short triggered a lawsuit establishing that copyrighted works could not be adapted without compensation, while this 1925 film was colossal for its time: The most expensive movie made during the silent period at a cost of almost four million dollars, epic in length at two and a half hours long, and featuring sequences in 2-strip Technicolor, it was a bold way for the newly-consolidated Metro-Goldwyn-Mayer studio to announce its presence, and remains an entertaining extravaganza. The story would have been familiar to all seeing it at the time: Judah Ben-Hur (Ramon Novarro), the prince of a wealthy Jewish family in Jerusalem in the time of Christ, is reunited with a Roman friend, Messala (Francis X. Bushman) who has returned as a soldier, only to discover that Messala is not quite the open-minded cosmopolitan as the Hur family - Judah's mother (Claire McDowell) would free their slave retainer Simonides (Nigel de Brulier) if the law allowed, and lets him keep his status secret from his daughter Esther (May McAvoy). When the new governor is injured while passing the Hurs' house, Messala imprisons Judah's mother and sister (Kathleen Key) and sentences him to work as a galley slave - although his actions during a pirate attack will set Judah on a different path, leading him to clash again with Messala in Antioch. It's a grand, sweeping story that spans the ancient world from Jerusalem to Rome and back, given a little extra gravitas by how it intersects with the stories from the New Testament, from the Nativity to the crucifixion. The filmmakers tread somewhat carefully here, keeping Jesus mostly relegated to the side of the screen - at most, a hand will reach out to gesture or heal. It's a rather self-conscious convention at times, although seldom to the point where it elicits giggles. Still, it's respectful and low-key enough that him being used as a deux ex machina once or twice doesn't come off as silly and the message of peace - even though the Israelites want a warrior-king - comes through.